"How about this one?" asked Steve enthusiastically. "Loads of rare track, only twelve quid." "Fine" I replied, not entirely convinced. "Where, when, who?" The tour was in fact organised (perpetrated?) by the Railway Development Society (!) to run on the 30th December, but had been postponed when we heard of it, to 18th March. The route included such oddments as Colwich Junction - Stone, the Castle Donington loop, Nottingham - Trowell Junction (recently severely threatened) and Leicester - Burton, shortly to acquire a revived passenger service. We booked! So it was that Chairman Steve, Dave and I took the 7.07am to New Street, to catch the 9.30am "Trent Train Tour". We noted no less than 3 class 90s at Wolverhampton, along with 86 506 "Lawrence Olivier", in Inter-City livery. "What does the "5" signify, Steve?" "According to the book, the 86/5s are re-geared for 75mph Railfreight Sector work. 86 506 is "Norwich Union". Hmmm! We had earlier heard from the organisers that the Castle Donington stretch was out "possessed by the Civil Engineer". Pretty uncivil of him, I thought. "Never mind, plenty other interesting bits". On joining the train when it pulled in (five minutes late) we found that another interesting morsel had slipped from our fingers - the Nottingham - Radford - Trowell line. "Last minute" civil engineers emergency track possession, the leaflet stated. "Oh well, its a day out!" The Trent Train Tour vacated New Street in the direction of Water Orton, there taking the Nuneaton line, out past Daw Mill Colliery where three NCB locos were visible - two Rolls-Royces and a Thomas Hill "Vanguard". At Nuneaton we performed the first of many reversals, and headed north up the main line, via Tamworth (another class 90) and Lichfield to Colwich Junction, where we were reminded of the crash there by a small, well tended flower- bed beside the line with a replica nameplate "City of Milton Keynes" prominently displayed. I reflected on the remarkably low casualty rate of that major collision, and thought, in view of the recent tragedies on the Southern, how well it reflected upon modern rolling stock design. Colwich - Hixon - Stoke was a new stretch for me. It is a double track, passenger line which is very difficult to travel on unless one wishes to go from Stoke to London! It sees no local traffic at all. Departing from Stoke, after reversal, we took the route for Uttoxeter and Derby, passing immediately outside the station the rusting tracks of the line to Leek. Since closure of the Froghall branch last year, followed by the Caldon Low traffic in February this year, the route has fallen into disuse. Main point of interest for many passengers was a line of five "Peaks" in a siding at Egginton Junction, shortly before joining the Birmingham - Derby line at Stenson Junction. More industrials were evident at Willington Power Station - a pair of 0-6-0 Drewerys, similar to the BR 03 design. It became clear that the "Peaks", despite being withdrawn nearly a year ago, are still in evidence in the East Midlands. Another stood in company of some 47s and other locos in service, looking as though it, too was serviceable. Apparently (its number was not visible) this was 45 135, destined for the Butterley. Yet another, 45 136, was in residence at the Technical Centre, along with other exotica, such as a pair of the ill-fated Class 210 DEMU power cars. Reversal at Derby took us eastwards to Nottingham, where we arrived at 12.30, in time for well earned refreshment (Thirsty work, this gricing!). A short stroll from the station found us in the Fellows, Morton & Clayton (of canal fame) hostelry, site of the only home-brewed ale in the city. "Bit cloudy" says Steve. "Tastes OK" says Dave. "Its just a haze" says I. Nevertheless, round two (it was Steve's) fell to "Castle Eden", which was beautifully clear (but somewhat inferior on taste!). Next on the agenda should have been the line to Trowell junction, instead we took the Beeston line to Toton. Much frantic recording here by the number-crunchers, with 20s, 58s and 37s in service, and some withdrawn 47s and a 25. A run up the Erewash Valley as far as Pye Bridge now followed, mainly to reverse, so that we could take the high-level goods line back to Trent junction. Highlights of this section were the magnificent iron Ilkeston viaduct of the GNR's route to Derby, long disused, and the purchase of a cut-price chicken bap (he was feeling peckish) by the Chairman. "This chicken must have been anorexic". "It was only 20p, Steve" "Grumble grumble". Continuing now down the Midland Main Line, we passed Radcliffe Power Station and headed south through Loughborough to Leicester. Yet another "Peak", this time 46 023, in company of some withdrawn 25s and 47s, and, we thought, an 03 shunter! We were to pass the line to their ultimate destination, Vic Berry's scrapyard, in a few minutes when, after another reversal, our train headed for Burton via the Coalville line. The route we now followed proved to be one of the most interesting, with its numerous collieries and quarries, with their associated sidings etc. Locomotives of classes 08, 20, 56 and 58 slumbered at Mantle Lane, while nearer Burton, a sad reminder of the past was provided by the recently lifted line to Cadley Hill colliery, a late outpost of industrial steam, now a late pit! Final clearance of the refreshment trolley along this stretch saw further consumption by your Chairman, this time a cheese and onion bap. Clearly a keen eye for a bargain! We were now due to rejoin the Derby - Birmingham line at Branston Junction, near Burton, which we duly did after a pause of several minutes. 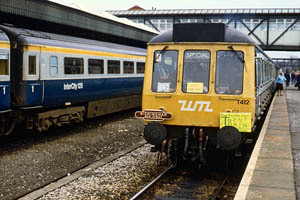 At this stage in a railtour, the schedule begins to take on an increased importance - our planned time of arrival at New Street gave a 12 minute connection into the Cambrian Coast Express, our best option for the return to Shropshire. Sadly we lost time for most of the last few miles, with the result that we missed the CCE and the immediately following local to Wolverhampton. Another local appeared at 5.45pm, which gave a reasonable connection into a sprinter for the last lap. Overall conclusions? An enjoyable day out, despite the disappointment of missing some interesting lines. Keep up the good work, Railway Development Society!